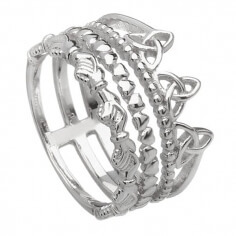 This intricately woven Trinity symbol ring is a beautiful symbol of eternal and endless love. The Trinity knot has no beginning or end and this often coincides with an endless continuation of life and love. It also has strong connections with Celtic heritage and the strong influence of the number three. There are also correlations with this symbol and the Holy Trinity. This ring is available in silver, 10K and 14K yellow gold. It is made for both men and women, and sizes run from 5 to 13. It makes a great gift for practically everyone. 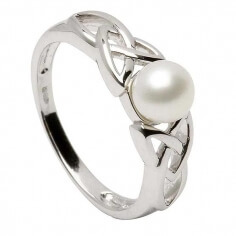 Handcrafted in Ireland by artisans and hallmarked in the Dublin Assays Office. The Trinity symbol was thought to originally be a way the Ancient Celts symbolized their triune deities. This meaning would be adopted by the Christian faith among many other aspects of the Pagan religion. It would come to symbolize the three sides of the Christian God – the Father, the Son, and the Holy Ghost. Before this there were many Goddesses, actually, that symbolized three different meanings. Brighde (Bridget) was one of the most common Goddesses. She was so popular that she later became a Saint in Christian faith. This was supposed to be a different person, but historians now believe that she was the persona of the Celtic Goddess. Lugus is actually one of the Celtic Gods mentioned as a possible triune deity. He is believed to encompass Esus, Toutatis, and Taranis. It is also possible that he was thought to be this type of God because of the threefold death that occurred in Celtic mythology. This could represent dying in three different manners at once or dying within three separate parts of a story. Many people who study Celtic history believe the trinity knot was one knot that helped to express their belief in birth, death, and rebirth - not only in human life, but in nature as a whole. This was because they depended on nature for life, and it was a part of their spiritual life. Service rating : The item purchased was a gift. The receiver loved the gift. I had trouble ordering the item not realizing it was an international order. I called Celtic Rings and they were wonderful in helping me complete the order. I would definitely recommend them for their merchandise and for their amazing customer service! Product : The Trinity Knot Band was gorgeous and more than I hoped for. They had a ring nearly identical to the one I lost. When I placed my order they double checked the size I specified. Shipping time was less than I expected. The ring is lovely. Service rating : Great communication - delivered a great product right on time! 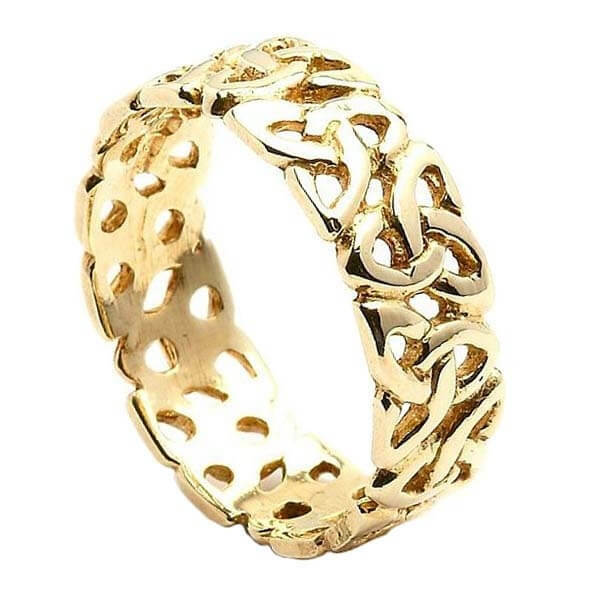 Product : A beautiful ring- my wife is very happy! Service rating : Very pleased with my ring. Exactly how I envisioned it.I got it the day they said it would come. Product : Very nice looking. Exactly what I wanted.